His ancestral village, Kundapur, is just 100km from Mangalore, but far from urban amenities. But even with ICICI Bank’s blistering expansion over the last decade, from a project finance house to universal bank, 3,600 ATMs, 35,000 employees, 18 countries and 25 million customers, there’s no ATM in Kundapur—as yet. So, bypassing the lack of infrastructure, ICICI Bank has helped create Financial Information Network and Operations’ (Fino) ‘smart cards’, which record customer profiles and thumbprints of villagers who normally would not have personal identification and land records. Since July 2006, using microfinance intermediaries and NGOs, more than two lakh villagers have used these cards to hook into the banking system, gaining access to loans and savings accounts. In the late 1980s, after a decade-long stint at ICICI, he moved to Indonesia to work with the Asian Development Bank. It was during this time that he got hooked to watching live television coverage of Formula One races. Today, like millions of F1 viewers, Kamath stays glued to the TV when a race is on. But, says Hormazd Sorabjee, editor, Autocar India magazine, and former rally driver, “Kamath’s encyclopediac knowledge is miles ahead of any armchair viewer." Prakash Kale, a former colleague at ICICI Bank who has known Kamath for more than 30 years, adds: “My family and I are Ferrari fans, and when we watch, it’s for entertainment. But Kamath can tell you who will win." How does he spot winning trends? “I look at the sport in totality," he says, “at who is managing the drivers, their diets, the tyres, strengths and weaknesses, the whole package. I even follow the track timings when cars are not actually racing but are getting tested, and I note how each chassis is doing." And then, he applies what he has learnt through his careful observation and analysis of the sport, to life. He reflects: “There are many strategies you could adopt from the track and apply to the world of business. The driver can’t deliver without the team of engineers who have put in the R&D to create the car. How well does the team support you when you are in the pit, when you need to change tyres in seven seconds flat, and when you need to refuel? How do you de-risk?" It’s clear that under Kamath, ICICI Bank has mastered the art of going past its peers: Today, it has the largest number of retail customers, and was the first to go into online trading and Internet banking. On the fund-raising side, in the current financial year, it has raised $5 billion (Rs19,650 crore) through a follow-on public offer in both the domestic and international markets, the largest Indian equity transaction to date. But, as Dr Ranjan Pai, who is on the Board of Manipal University along with Kamath, points out: “Many people dream big. With his time-bound planning and meticulous attention to detail, Mr Kamath also knows how to implement on a large scale." This November, in a tie-up with the bank, a Manipal University affiliate will commence an ambitious nine-month, fully residential executive MBA and finishing programme in Hyderabad and Manipal, to train a couple of thousand fresh, small-town recruits. The bank will pay them a stipend throughout, ensuring a great talent pool for the company. Kamath elaborates: “We found a useful Harvard Business Case study on the Ritz-Carlton hotel’s training programme. They have a documented process called Instant Guest Pacification, where any employee who receives a complaint from a customer takes pride in owning it, resolving it to the guest’s satisfaction and recording it. Our retail branch officers also are being trained to treat clients in a similar manner." Of the many great Formula One legends, Kamath’s personal favourites are drawn from times past. He mentions Alain Prost, winner of the 1987 Brazilian Grand Prix, who said “The only thing you can judge in this sport is the long term. You can judge a career or a season, but not one race." Another racing stalwart and Prost’s contemporary, Ayrton Senna, used racing as a metaphor for life, saying: “The harder I push, the more I find within myself. I am always looking for the next step, a different world to go into, areas where I have not been before. It’s lonely driving a Grand Prix car, but very absorbing. I have experienced new sensations and I want more. That is my excitement, my motivation." He could well have been talking about Kamath. At the photo-shoot, as the banker delights over the delicately crafted 2004 red Ferrari diecast model of the car that Michael Schumacher drove to win his 7th World Championship title, he reflects on the newest racing star, 22-year-old rookie Lewis Hamilton, whose current lead was slashed by an unexpected mishap. Losing his grip, the McLaren slithered off the track and was beached in the gravel trap just yards short of the tarmac. 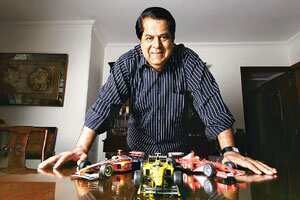 “Overtaking is a science and an art," says Kamath. “Only when you’ve got all elements right should you manoeuvre. You must know your limits." And you know that though he’s talking about Hamilton, like everything else, this learning too, will be fruitfully applied to ICICI Bank. Claim to fame: Transformed a single-product, project finance entity into a multi-specialist financial services conglomerate, ICICI Bank, in less than a decade.